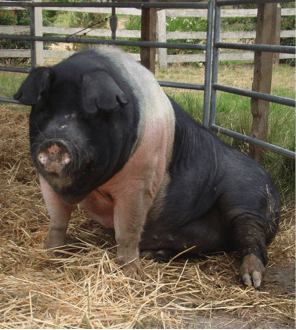 Once again, one of our animals helped to shift our thinking and led us to the natural path of death, which became part of BrightHaven’s Menu for Healing. “In BrightHaven’s early years there was no such thing as natural death for us, as we believed euthanasia was always the kindest way for a life to end, that is until Mariah helped to change our thinking. 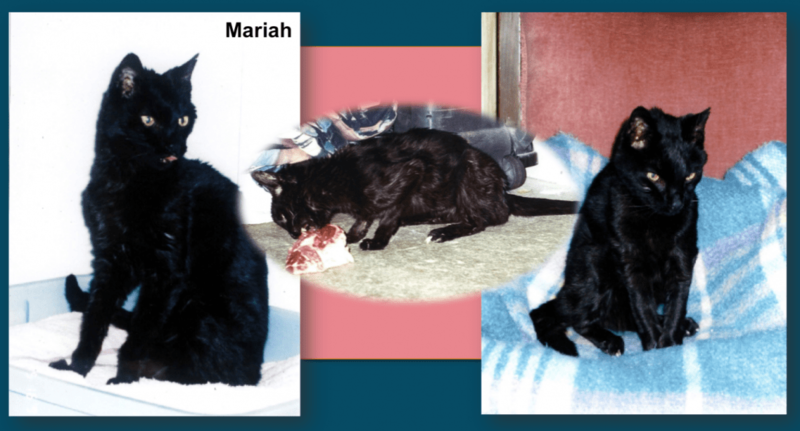 Upon arrival Mariah refused to eat anything but raw, ground, beef-heart and to the day she died almost two years later, her diet remained that along with the occasional meaty bone she could drag away from an unsuspecting dog! Mariah walked slowly and looked unbelievably frail but lived on and on and was adored by everyone. Sadly we watched as her energy declined and her gait wobbled and then came the day she was clearly at the end of her life. I was alone at the sanctuary and unable to leave to take her to the vet office where I worked, to have her euthanized — and was at home distraught as to what to do…I was held tightly in the grip of uncontrollable fear. Right on queue friend and holistic mentor Vicki Allinson called, and I plead with her to drive over to come to my aid. I was horrified and my fear doubled but she talked me down–told me to get a grip on myself and go sit with Mariah in the garden under the big old oak tree and just “be” with her in nature and compose myself. Having no other real option, I did just that, and gradually my fear began to somewhat subside and I calmed down with Mariah lying peacefully in the grass beside me. Eventually she became a little restless again and I helped her climb back into my lap. Mariah lay down very slowly and lifted her head to gaze deeply into my eyes – and then gave a deep sigh as though to say, ‘You see, it wasn’t so bad was it?’ and slipped gently, peacefully, painlessly and naturally away. 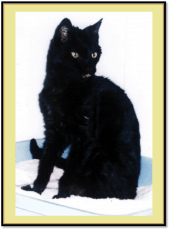 At BrightHaven when an animal enters hospice care our expectation is that the animal will have a painless, loving, peaceful journey followed by a painless, loving, peaceful & natural death. If a place is reached during that journey where the caregiver, the veterinarian and the animal believe that the animal is in need of critical assistance, then euthanasia will be used. BrightHaven has supported over 600 animals through the dying process and have euthanized only 20 over the years–the last euthanasia was about 180 deaths ago, with the exception of Daisy the horse in July 2015. If you go through this process with courage and grace, I promise that you will no longer fear death and your perspective on life will be forever changed to one of acceptance and peace. What greater legacy can our animals leave us? What About Quality of Life, Pain, Suffering & Will to Live? Quality of life, pain, suffering and will to live are always uppermost in our minds as we consider the path to actual death. 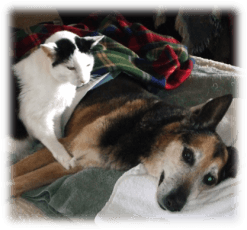 Of course, monitoring for pain and treating it is an important part of animal hospice. BrightHaven places great emphasis not only on quality of life, but also on quality of dying. Our Menu for Healing was designed to promote balance of body, mind and spirit for our animals through all life stages, including dying. Pain can and should be addressed as a part of daily care. Suffering is a broad topic and is hard to define when we all suffer to some degree at birth, during daily life and also in death. The stories of Patti the dog, Harley the hog and Jackie the cat share a different perspective on suffering. Coming in 2016: An online self-paced learning program, which includes a module that will go into deeper detail regarding natural dying, and also a module that share BrightHaven’s gentle shift from a conventional to a holistic healing approach. Once again, I can’t thank you enough for your words and faith in my journey with Romi’s final 11 days with me in body and spirit. It has changed me forever. Our Menu for Healing is also affectionately known as “The Love Sandwich”, as it begins and ends with love, and its healing power can never be exaggerated.